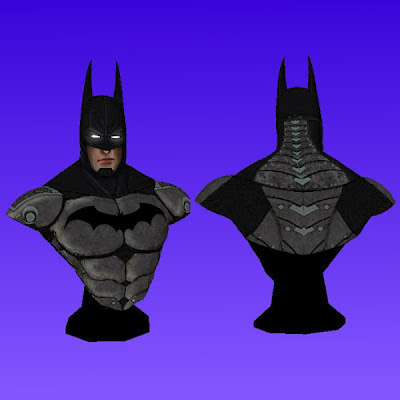 This 26" (67cm) tall papercraft bust of Batman is how the Dark Knight appears in the Batman: Arkham City video game. The game was one of the highest rated to be released in 2011. 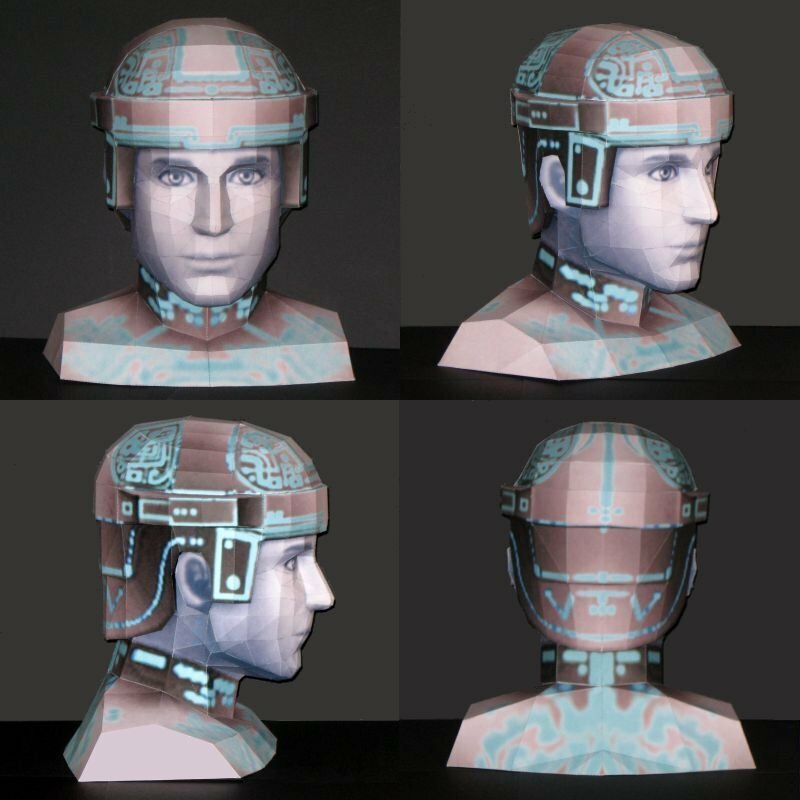 The template for the bust is available in Pepakura PDO format only and may be downloaded at Paper Juke. In the Kingdom Hearts video games Donald Duck is a magician and his default weapon is the Mage Staff. 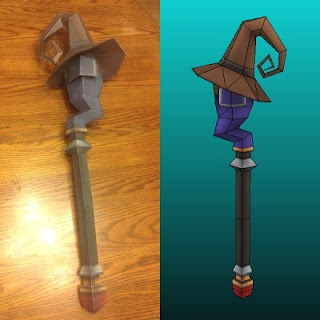 This full size paper model of Donald's Mage Staff was created by my papercrafter friend Skmagiik. It is his first successful papercraft creation! The template for the staff may be downloaded here. Medabots was first a video game (1997) and later an anime television series (1999 - 2001). The story line of the franchise revolves around ancient robots who call themselves Medalorians. This paper model is of Rokusho, a mysterious wandering robot who is guided by a strong sense of honor. The template for this papercraft was created by StormL and may be downloaded here. The build photo above is by marlous2604. By my reckoning, this papercraft is my 100th release! Since one of my first paper model releases was Tron related, I wanted to do another Tron papercraft for release 100. This is a bust of Tron as he appears in the Kingdom Hearts video games. At roughly 12" (30.5 cm) tall the bust is slightly smaller than life. The download for the template is available here and includes lined and unlined PDF files and a Pepakura PDO file. Finn, a 14 year old boy, and Jake, a magical dog, are the lead characters in the hit animated television show Adventure Time. 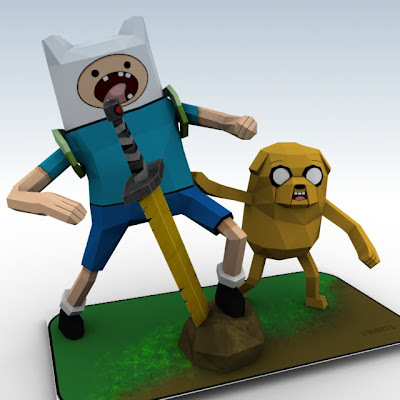 Up until now, most (if not all) Adventure Time papercraft I have seen has been somewhat boxy looking, so I was happy to see papercraft creator X3dart create a more three dimensional rendition of the pair. The template for this paper model is available in Pepakura PDO format only and comes with alternate textures for Finn and Jake's faces. 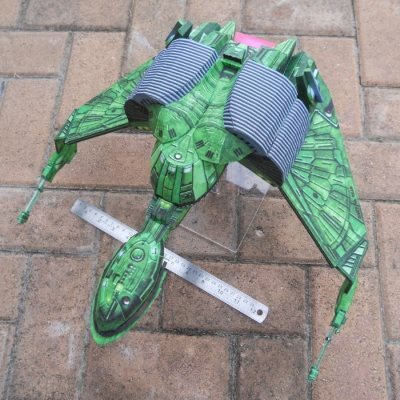 X3dart's download page is located here. 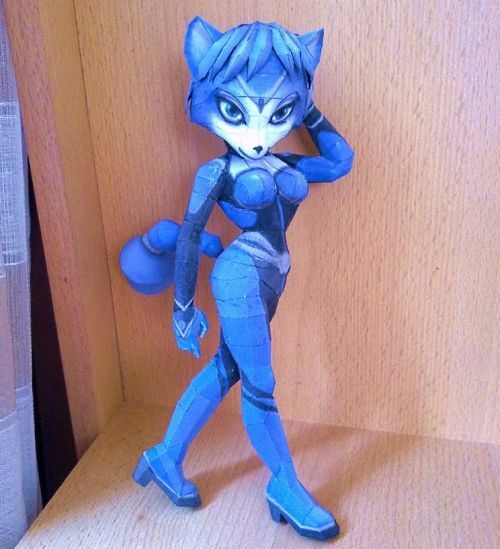 "Krystal is a female native fox of Cerinia, a planet outside the Lylat System. Krystal became proficient in using a powerful staff weapon, as well as her natural abilities of telepathy." 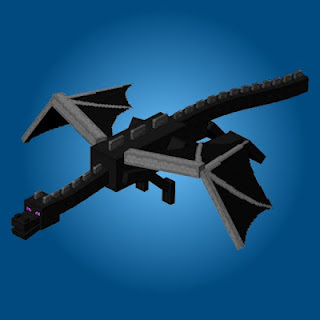 The build photo above is by 404bot at DeviantART. 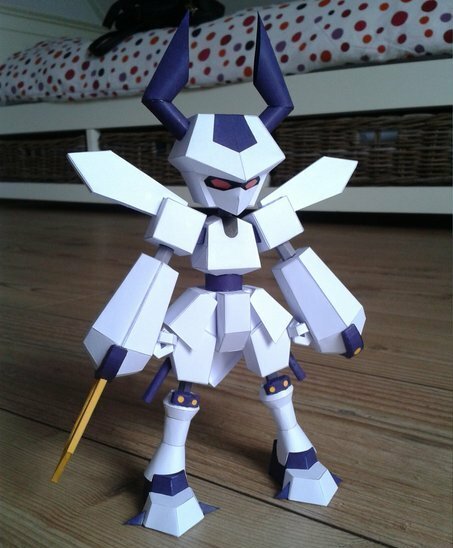 The template was released in 2010 by Nintendo Papercraft, the best source for Nintendo themed papercraft on the web. 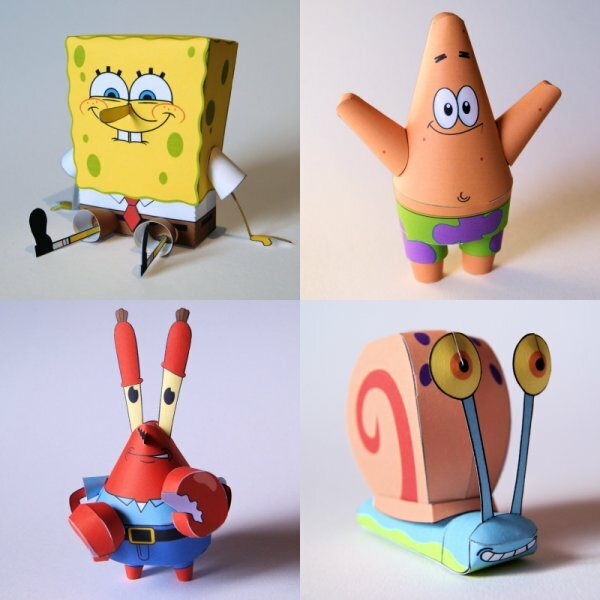 There are lots of SpongeBob papercraft models around, but these have to be my favorites. Each one was created by Philipp S. of Germany. Included in the set are SpongeBob SquarePants, Patrick Star, Gary the Snail, and Mr. Krabs. The templates for each of the characters may be downloaded from Philipp's DeviantART page here. A tetrahedron has a pyramid shape. If five tetrahedra are intersected, a polyhedron is created that is similar in shape to those found in the art of M. C. Escher. This glue-less origami tetrahedron construction was built by Crackpot Papercraft using instructions provided on Thomas Hull's Origami Mathematics website. 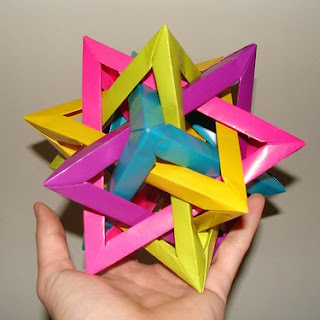 The tetrahedron origami units used to construct the polyhedron were originally developed by Francis Ow Mun Yin. According to the Digimon wiki, Garurumon is a Digimon who "possesses a furious combat instinct and sinews honed in freezing lands, as well as carnivore-like agility and the accuracy to reliably bring down its targets." 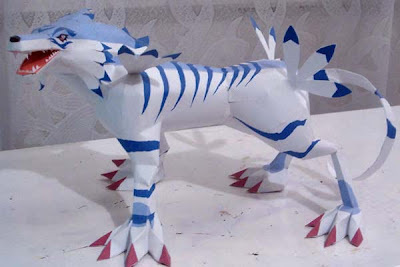 The template for this papercraft Garurumon is tough to find as the original website of it's creator no longer exists. 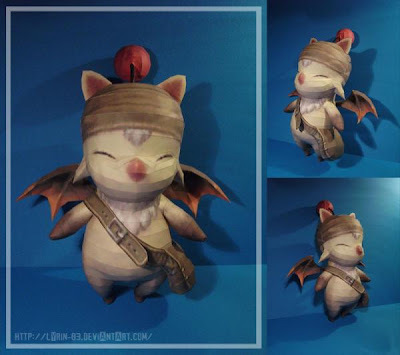 However, Papercraft Museum still has a copy available here. Previously posted was a paper model of Garurumon's pre-evolved form, Gabumon. In the Nintendo video game universe, Princess Peach and Princess Daisy are the best of friends. And while it has never been stated specifically in any video game, most Nintendo fans assume that Peach and Mario are a pair and that Daisy and Luigi are romantically involved as well. 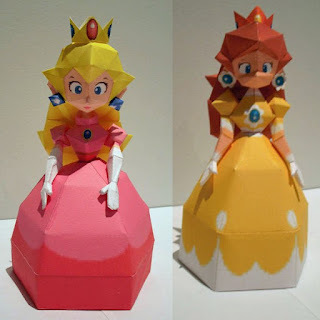 These papercraft likeness of the two Nintendo princesses are the creation of Icthus7. 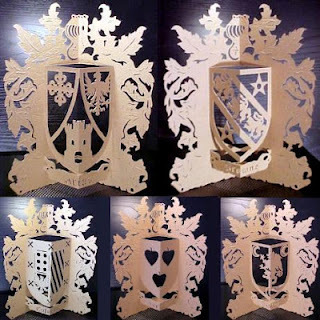 Their templates may be downloaded here and here. Build photos above are by CJM99 at DeviantART.